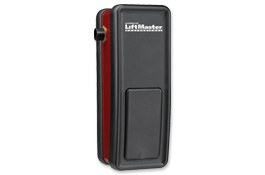 Model DHJ is an industrial-duty hoist/jackshaft operator with an internal door lock sensor. 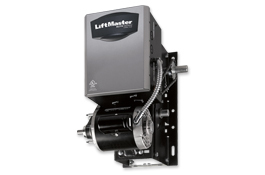 It features a removable hinged electrical box cover, a continuous-duty high-starting torque motor, a universal-mount frame design, industrial ball bearings on the output shaft and an emergency chain hoist with electric interlock. 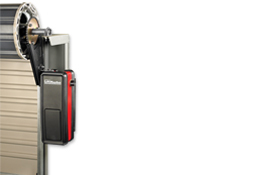 Model 3950 is a jackshaft operator for commercial rolling sheet door applications – ideal for self-storage facilities. It features a compact design ideal for public, boat, and RV storage facilities. It may be used on commercial rolling sheet doors with live or dead shaft measuring up to 12 ft. high and up to 14 ft. wide, but not exceeding 650 lbs. 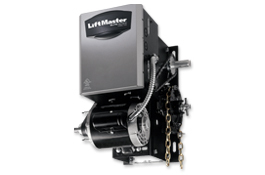 Model 3900 is a light-duty jackshaft operator for light-duty commercial sectional applications only. It features a compact design ideal for limited height, cathedral, or obstructed ceiling installations. It may be used on standard and high-lift (maximum 7 ft. high-lift) sectional doors measuring up to 14 ft. high and up to 18 ft. wide, but not exceeding 180 sq. ft. or 650 lbs.